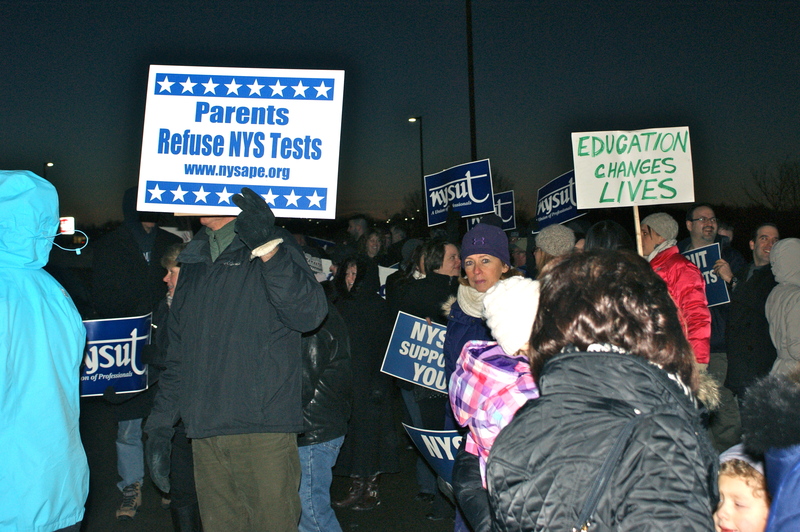 NEW HARTFORD – A setting sun behind them, falling January temperatures around them, approximately 250 to 300 NYSUT members and public education advocates rallied at the entrance to Oneida-Herkimer-Madison B.O.C.E.S. on Thursday evening. Huddled close, bundled up in hats, gloves and scarves amid the crush of winter, yet determined and boisterous, they came in response to New York State Governor Andrew Cuomo’s proposed public education reforms in his recent State of the State address, carrying signs and shouting slogans before a meeting of local school board presidents. “It’s rage that brings us out here tonight,” commented an unidentified participant upon learning the name of this citizen journalism outlet. Indeed educators, administrators and parents alike should be raging over Cuomo’s proposed reforms for public education which effectively mitigate local control over already controversial evaluations, increase the dependence on standardized tests, increases funding for the unproven charter school model, closing low-performance schools in a state already notorious for uneven allocation of aid and several more. Members of several local school districts attended the rally. The active crowd also consisted of teacher’s associations, parents and educators from local districts such as Herkimer, New Hartford, Waterville, Central Valley, West Canada Valley, Mt. Markham and Utica. Noted are the Herkimer and Utica districts who are among the poorest in the state, a major obstacle for millions of students throughout New York. In fact, while the Governor cites a crisis in public education, the actual data presents a less grim image of education and highlights factors of income inequality among student populations instead. Up to 32 percent of SAT takers in New York are eligible for a fee waiver. While the state ranks right around the average for students living in poverty (21 percent), the state’s impressive spending on education, ranked second in the US, is offset by how it is reflected, or rather is not reflected, in in-need districts. “We want to support all of our K-12 brothers and sisters in their fight against the attack from Governor Cuomo,” added Norma Chrisman, member and president of the MVCC Professional Association. The local from Mohawk Valley Community College saw at least half a dozen members showing their solidarity with other NYSUT members. 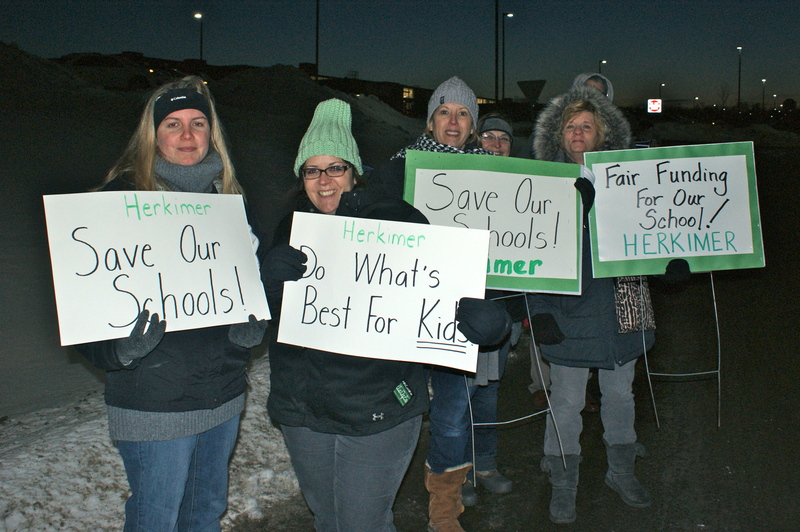 “We’re out here trying to get what every child is entitled to by the United States Constitution,” said Kristin Stallman of Herkimer, as she held a sign bordered with the green of the district’s school colors. On the topic of constitutions, specifically that of New York State, the advocacy group NYSAPE (New York State Allies for Public Education) intends to pursue an independent investigation of Governor Cuomo based on what is seen as unconstitutional oversight to directly interfere in the state’s education policy. While there is still much to be determined in the months and years ahead, Central New York has added its voice to the choir of districts and other supporters across the state that there is untapped value in New York’s public education system and that those wishing to derail while dismissing the facts are in for a fight.